Today, I’m excited to share a guest post with you that was written by Chad Carson from CoachCarson.com. This is a post I’ve been wanting to write for years but since I’m not a real estate investor, I didn’t have the knowledge or experience to do it. Luckily, Chad has both (he’s been a full-time real estate investor for nearly 15 years) and was kind enough to write the ridiculously informative post you’re about to read. Side Note: Chad’s new book, Retire Early with Real Estate, was just released yesterday and it’s fantastic so go check it out! A big thank you to Chad for taking the time to put this together and I hope you enjoy it as much as I did! Like the Mad Fientist, I love benefiting from tax laws to help me reach financial independence earlier. But instead of pretax retirement accounts and stock index funds, my primary focus has been on the tax benefits of real estate investing. I’d like to share 10 specific benefits with you in the rest of this article (including updates from the Tax Cuts & Jobs Act enacted by the U.S. Congress in December 2017). But first, a little background on me. I’ve been a full-time real estate investor since 2003 soon after I graduated from college. But my foray into real estate was not an obvious choice. When my NFL football dreams fell flat (I was a middle linebacker at Clemson University), I stumbled upon the idea of real estate investing while reading a book. With a Biology degree and German minor, I was basically qualified to tell you the species of trees at a house and translate them to German! But I loved the freedom of entrepreneurship and the challenge of learning something new. So, a business partner and I dove into real estate investing in 2003 and never looked back. As fledgling real estate investors, we had two challenges. First, we had to use real estate to make a living. Second, we had to use real estate to build wealth so that we could achieve financial independence. To make a living we got into the real estate business. We learned how to find and quickly resell deals for a profit. Sometimes we sold these in as-is condition to other investors (aka wholesaling). Other times we fixed them up and sold them to end-users (aka retailing). To build wealth and retire early, we also began buying real estate investments. We wanted our investments to grow and fund our early retirement with regular, steady income. Luckily, real estate has many different strategies to do both of those very well. Along the way, we bought and sold hundreds of properties. And today we still own 90 rental units in and around the small college town of Clemson, South Carolina. I don’t tell you this because you need to replicate what I have done. The opposite is true. If you have a regular job to pay the bills, you can accomplish amazing financial results with just a few investment properties. And the real estate strategies I have used work very well in conjunction with other investment strategies like stock index fund investing as taught by the great JL Collins. Without profits, tax benefits are not relevant. So, let’s first look at how you make money in real estate investing. Income: Regular cash flow from rents or interest payments. I consistently see unleveraged returns of 5-10% from this one method of making money. With reasonable leverage, it’s possible to see these returns jump to the 10-15% range or better. Depreciation: A required accounting method that spreads the cost of an asset over multiple years (27.5 years for residential real estate). This paper expense can “shelter” or protect other income from taxes and reduce your tax bill. I’ll explain depreciation in more detail later. Equity: If you borrow money to buy a rental property, your tenant essentially pays off the property for you. You use the rent to pay the mortgage, and each month the principal paydown (aka equity) gets bigger and bigger like a forced savings account. Appreciation: Over the long-run real estate has gone up in value about the same rate as inflation (3-4%). This passive style of inflation helps, but active appreciation is even more profitable. Active appreciation happens when you force the value higher over a shorter period of time, like with a house remodel. Leverage: Many investors use debt leverage to buy real estate. This means, for example, $100,000 can buy four properties at $25,000 down instead of just one property for $100,000. Leverage magnifies the profits mentioned above (and potentially the losses). Plus, interest on debt is deductible as a business expense. Not every real estate deal has every one of these profit centers. And sometimes you have to give up one in order to get another. For example, one time I purchased a mobile home on land. I paid cash (so no leverage and no equity growth). The mobile home itself went down in value like a car (negative appreciation). But the income was excellent. And the depreciation sheltered some of the income from taxes. Another investment was a more expensive single family house in a great neighborhood. Initially, the net rent after expenses barely paid the mortgage (no income). But my equity built up quickly because the loan amortized quickly. And the property was in a great location likely to appreciate at or above the overall inflation rate. Now you know the basic ways to make money. Let’s move on to 10 different tax benefits of investing in real estate. The IRS uses depreciation to acknowledge that an asset wears down over time. Somehow they discovered that residential real estate wears down in exactly 27.5 years (sarcasm intended). Other assets have different timelines. Unlike other business expenses, depreciation is a paper loss. This means you don’t spend any money, yet you still get the expense. This expense can offset taxable income and save money on your tax bill. The higher your tax rate, the more taxes you would save in this example. Depreciation is not unique to real estate, but real estate investing uniquely benefits from depreciation. Why? Because the cost of real estate is so large and often purchased with debt. A $200,000 building depreciated over 27.5 years provides tax shelter of $7,272 per year. If you had 3 rental properties, you’d shelter $21,816 of income from taxes and possibly* save $5,454 on your tax bill (at a 25% rate)! There are also other nuances and details related to applying depreciation expenses. If you want to go deep and nerd out, Depreciation For Side-Hustlers by Jeremy at GoCurryCracker.com is a great place to start. And the IRS publication about Depreciation of Rental Property makes for excellent weekend reading with a craft beer. Also keep in mind that what the IRS giveth, the IRS taketh away. When you sell a rental property, it’s very likely that you’ll have to recapture the depreciation and pay taxes on it. The tax rate on this recaptured real estate depreciation is usually 25%. This creates a big incentive to keep real estate or to use other tax savings strategies when selling, like a 1031 exchange. I’ll discuss the 1031 exchange later in the article. *There are catches to how much you can depreciate. I’ll cover those in the next section. Prior to the Tax Reform Act of 1986 real estate investors took full advantage of depreciation and real estate losses to shelter other sources of income. This was so popular that many high-earning investors bought real estate simply for its tax advantages. Eventually, president Reagan, congress, and the IRS caught on. So, the rules changed (this is a good lesson to not depend upon beneficial tax rules forever). To summarize the changes, depreciation expense on a rental property was and is still deductible against other passive income. But let’s say there is an excess loss. For example, your rental income is $3,000, depreciation expense is $5,000, resulting in a $2,000 rental (passive) loss. Can that $2,000 loss shelter other nonpassive income, like your dividends or job income? After the tax reform, usually no. $25,000 exemption – You can deduct up to $25,000 of passive rental loss against nonpassive income if your income (MAGI to be exact) is below $100,000 and you actively participate with your rental. Real estate professional – You can deduct ALL of the passive rental loss against nonpassive income if you or a spouse qualify as a real estate professional (here are the standards). Year of sale – You can deduct ALL of the passive rental loss (even from past years) against nonpassive income the year you sell the rental property. So, you’re good up to $25,000 of deductions if your income is below $100,000 and if you’re active with your rental. Many early retirees accomplish this anyway to benefit from other tax angles like Obamacare subsidies and Roth IRA conversion ladders. You’re also very good if you’re a real estate professional. But among other things, the rules require you to spend 750 hours or more with your real estate activities. Sort of defeats the purpose of retirement, doesn’t it? The third exception means you get to eventually use your passive losses when you sell. These losses can be used to offset depreciation recapture and capital gains from the sale. This is not as good as immediate deductions, but it’s a decent consolation. Some of the other tax benefits of real estate are more straight forward. Just like dividends and interest income, rental income is not subject to social security and medicare taxes (aka FICA). While this is not an enormous benefit when compared to other investments, it is significant when compared to normal earned income. If you earn money at a normal salaried job, you pay 7.65% (as of 2018) of your salary in FICA taxes. If you’re self-employed, you pay 15.3% towards FICA tax. With a $100,000 salary, that’s $7,650 or $15,300 out of pocket from your salary. But if you earn $100,000 in rental income, you avoid the tax completely. This is a big incentive to start earning your money from rental income. When you sell, you pay transaction fees, commissions, and taxes. All of these costs drag down your long-term performance because you forever lose the ability for those dollars to compound and grow. And real estate appreciation doesn’t get taxed by the IRS. So, if you buy and hold for many years it’s possible to let your net worth grow with minimal tax exposure. And when you do choose to sell, real estate has other benefits. As of 2018, long-term capital gains tax rates are between 0% to 20%, depending upon your tax bracket. Of course, the shifting political climate can always change these rates. But in general capital gains tax rates are lower than ordinary income tax rates. Low capital gains rates are an advantage if you build your long-term investment strategy around strategically selling real estate for growth or living expenses. For example, one year my deductions and rental depreciation placed me into the second lowest tax bracket. I happened to sell several properties that year, so my long-term capital gain tax rate was 0%! But even in the higher brackets of 15% or 20%, capital gains tax would have been better than the equivalent income tax on ordinary income. What if you want to avoid capital gains tax altogether? Then just buy and immediately move into the house as your principle residence. As long as you live in the home 2 out of the next 5 years, in the U.S. you can make a tax-free profit of up to $250,000 as an individual or $500,000 as a couple. Canada and the U.K. have slightly different rules, but the principle is the same. A real estate strategy called the Live-In Flip takes advantage of this generous tax exemption. Carl from 1500days.com wrote an awesome guest post for me explaining how several live-in flips built enormous wealth and accelerated his path to early retirement. Keep in mind that this doesn’t have to be a permanent strategy. You could do 2 or 3 flips, reinvest the earnings, and move on to other investment strategies. Another way to avoid capital gains tax (and also depreciation recapture tax) is a section 1031 tax-free exchange. This technique is named after section 1031 of the U.S. tax code. A 1031 exchange allows you to trade one property for another without paying taxes. You must follow specific rules, and you must be classified as an investor (i.e. not a dealer who flips houses). Why is this helpful? Because you get to use 100% of the profits from the sale to reinvest in the next property. This maximizes the growth and compounding of your investments. For example, let’s say you sell a property for $300,000 without a 1031 exchange and pay $35,000 in capital gain and depreciation recapture taxes. By avoiding these taxes using a 1031 exchange, you would keep that $35,000 invested. At 10% for the next 20 years, that $35,000 would grow to over $235,000! I am currently doing my first 1031 exchange. The technical side of the process has been relatively straightforward because I hired a third party “qualified intermediary” to handle it for me. The most difficult part has been finding a good replacement property in time, but fortunately, I do have one under contract. Perhaps a future post can spill all of the details! **UPDATE** The Tax Cut & Jobs Act of 2017 did retain the use of 1031 Tax-Free Exchanges. But there was one negative change for exchangers. Now only real property (the real estate building and land) can be exchanged. Any personal property (appliances, furniture, etc) can not be exchanged. For large apartment complexes with furnished apartments, this could mean significant taxes paid on a transaction. The IRS gives property investors another tool to reduce taxes on the sale of real estate. This tool is called an installment sale (aka seller financing or seller carry-back mortgage). Like 1031 exchanges, installment sales are only available to property investors and not to dealers (house flippers). Also like 1031 exchanges, installment sales allow an investor to defer capital gains tax, but unfortunately the entire amount of accumulated depreciation must be recaptured at the initial time of sale. From a practical standpoint, an installment sale just means the seller of an investment property receives the sales price over time. The seller is essentially extending credit to the buyer instead of the buyer getting a bank loan (here is my visual explanation on YouTube). For example, a duplex owner could sell me her property for $300,000. $30,000 could be a down payment, and I would still owe $270,000 in the form of a seller financing mortgage. The terms of the financing might be $1,934 per month at 6% for 20 years. This arrangement would be most beneficial if the duplex owner owned the property for a long time and experienced a huge run-up in prices. For example, my duplex owner might have bought the property for $50,000 over 30 years ago. An installment sale would allow this owner to only pay taxes on the profits received each year. A $250,000 gain at one time would have pushed the seller into higher tax brackets. But the installment sale allows the seller to slowly receive the gains and possibly stay in lower, more favorable tax brackets. It’s also worth mentioning that installment sales can be a great way to transition out of active property management and into a period of more passive income. I have done this on many properties myself. To raise cash most investors consider selling investments. As I’ve shown above, this exposes you to taxes or complicated procedures to avoid tax. But with real estate you have another choice. You can simply pull capital out of an investment tax-free by refinancing. This is exactly what I plan to do to help fund my two daughters’ college educations. I shared all of the gory details with spreadsheets and graphs at How to Pay For College With Real Estate Investing. You’d be right to say this technique increases my risk by incurring new debt. But as long as the debt is attractive (fixed interest, low rate, long amortization) and covered conservatively with cash flow and cash reserves, this is a risk I am personally very comfortable with given the benefits. IRAs and 401k style retirement plans are incredible tools to build wealth while minimizing taxes. But most people think of them only as tools to invest in traditional investments like stocks, bonds, mutual funds, and REITs. While this is the norm, it’s not the rule. The IRS does not describe what your IRA account can invest in. It only describes what you can NOT invest in. The “do not invest list” includes life insurance and collectibles like artwork, rugs, and antiques. Non-traditional investments like real estate, private mortgages, limited partnerships, and tax liens are therefore allowed. But most larger retirement account custodians (i.e. Vanguard, Schwab, etc) do not choose to offer them as a possibility. So, there is an entire industry of specialized custodians who do allow investments in these non-traditional assets. A google search will give you dozens of possibilities. I personally use a company called American IRA . While self-directed IRAs are a wonderful tool, there are many pitfalls and strict rules to be careful of. For example, you can’t self-deal by loaning money to yourself or to another disqualified person, like a close family member. If you break one of the rules, you could face large penalties and disqualification of your account from tax-free status. My favorite way to invest with my IRA is a loan against real estate. It’s lower risk and has fewer moving parts than actually owning the real estate itself. I have also purchased local property tax liens, which often pay high interest rates and even sometimes get you a deed to real estate for pennies on the dollar. This may sound like a joke, but one of the best plans (at least as a tax strategy!) is to die with your real estate. Instead of facing the tax issues of recaptured depreciation or capital gains tax, your heirs instead get a stepped-up basis. For example, let’s say you bought a rental house for $100,000. Forty years later you die and the house is worth $500,000. When your heirs sell the house, they would not pay capital gains tax on the $400,000 gain. Instead, their basis would be $500,000, which means they could sell it for $500,000 and have no capital gains tax to pay. Keep in mind that inherited assets are still subject to estate taxes. But as of this writing (2018) $11.18 million of assets are exempt from any estate taxes. So, your heirs would inherit a lot of property before paying any taxes. Of course, you don’t have to let the tail wag the dog. Tax benefits are only part of the overall equation of finances in your life. You may have plenty of legitimate reasons (like enjoyment of life!) to pay taxes and spend the money before you die. You could also contribute a portion of your assets to charity, still pay no taxes, and help decide how worthwhile causes will benefit from your wealth while you’re alive. Now let me cover the highlights of how the Tax Cuts & Job Acts of 2017 affected real estate investing. After the recent U.S. tax law change, real estate investors retained almost all of the existing benefits already explained in this article. But there were some changes to pay attention to. Most will make real estate investing even more beneficial tax-wise. But a couple may negatively affect investors in certain situations. I’ll describe the highlights of these changes below. But if you have a lot of time and enjoy punishing your brain, knock yourself out with the entire new tax law. Both property taxes and mortgage interest deductions are now limited for a primary residence. But rental property taxes and mortgage interest ARE still deductible. So, this change only negatively affects owners of a primary residence in high-cost areas, like someone doing a live-in flip in San Francisco. Mortgage interest is now only deductible on the first $750,000 of acquisition financing on primary and secondary residences. If you previously purchased a residence, a grandfather clause will allow you to continue deducting the interest on up to $1,000,000 of debt. And state and local taxes are now limited to a total $10,000 deduction. This means, for example, that even if your total state income and property taxes (for your residence) are $20,000, you can only deduct $10,000. Perhaps the biggest new tax-break for small businesses is the 20% pass-through deduction (explained in section 199A of the new tax law). The Mad Fientist literally got the guy who wrote the book on this tax break to write an awesome guest post. I can’t hope to improve on what he already said, so I’ll be brief here. In summary, the pass-through deduction represents a 20% reduction in taxes on your business income if you qualify! That’s huge! What does that mean? Even tax professionals argue about it. But on one extreme, a very passive commercial landlord who simply collects net-lease rent checks from a Walgreens does not seem to pass the test. And on the other extreme, an Airbnb host who actively moves people in and out does seem to qualify. Landlords in between are in the grey area. So, I recommend you work closely with a tax professional and keep an eye on updated IRS regulations if you plan to use this deduction as a real estate investor. It could be profitable, but you need to have a good defense for your position. The new tax law made it easier to quickly depreciate personal property (i.e. save more on current taxes). This means your purchase of rental property equipment like carpet (unless it’s glued down), refrigerators, stoves, washers, dryers, and other non-attached property can often be 100% depreciated in the first year. You can also quickly depreciate computers and other eligible office equipment used for rentals or other business. Creative investors and their tax professionals may also use cost segregation (ie. splitting up the basis of a rental into separate components) to also write off land improvements. This means things like sidewalks, driveways, and landscaping which could be depreciated more quickly. But this area of tax law is another tricky one. Tread carefully and get professional tax help. And if you read tortuous (yet sometimes humorous) tax articles for fun (Mad Fientist, GoCurryCracker, and I are raising our hands, anyone else? ), then have fun reading my favorite tax geek in this Forbes article Changes to Depreciation in the Tax Law. A new concept called an “Opportunity Zone” is perhaps the most innovative and profitable tax law change for real estate investors who can take advantage of it. To benefit from the change, you must invest in certain areas of the country that are designated as Opportunity Zones. These zones are typically economically-distressed areas (national map of all economic zones). The vehicle for this investment is called an Opportunity Fund, which is just any partnership or corporation that self-certifies that it is an Opportunity Fund (i.e. you just fill out an IRS form). 1. A temporary deferral of capital gains taxes if funds are invested in an Opportunity Fund. You eventually pay taxes on the deferred gain either when the opportunity zone investment is sold or December 31, 2026, whichever is earlier. For example, you could sell $200,000 of appreciated stock (i.e. a basis of $100,000), reinvest in an opportunity fund, and pay no taxes on your $100,000 of gain until the fund’s property is sold or December 31st, 2026. That’s years of tax-free compounding! 2. A step-up in basis for capital gains reinvested in an Opportunity Fund. The basis is increased by 10% if the investment in the Opportunity Fund is held by the taxpayer for at least 5 years and by an additional 5% if held for at least 7 years, thereby excluding up to 15% of the original gain from taxation. So, in addition to the deferral of tax in #1, you get a reduction of your original taxable gain by holding onto the investment for 5 to 7 years or more. 3. A permanent exclusion of your taxable capital gains from the sale or exchange of an investment in an Opportunity Fund if the investment is held for at least 10 years. This exclusion only applies to gains accrued after an investment in an Opportunity Fund. For example, if you bought an Opportunity Zone property for $200,000 and sold it more than 10 years later for $500,000, you’d pay zero tax on $300,000 of new capital gain! As you can see, this is an incredibly generous tax benefit. But it’s such a new provision that the method of implementation and long-term effects are unknown. I plan to keep a close eye on it, so perhaps the Mad Fientist and I can brew up a future article to keep you updated! As you have seen, tax benefits are a compelling reason to get involved in real estate. But tax benefits are never the sole reason to invest in real estate or anything else. Basic economics and quality of your investments are primary factors to consider when choosing your strategy. And you also need to make sure real estate fits your lifestyle. I think real estate is often overlooked as a viable retirement strategy, especially by early retirees. But it’s clearly not for everyone. Do your homework and figure out what’s best for you. And if you choose to invest in real estate, be sure to build a team of professionals to support you. One of the most important team members will be a tax professional like a CPA or qualified tax attorney. All of the strategies I’ve mentioned here are a start, but a professional can help you apply the details to your situation. What do you think? Have you benefited from investing in real estate? What tax angles have been most beneficial to you? Did I leave any out? Hey, it’s the Mad Fientist again. That was amazing, wasn’t it? If this post got you excited about real estate and you’re interested in learning how you can use real estate to retire early, Chad just published a book that dives into exactly that topic – Retire Early with Real Estate! I’ve also interviewed Chad twice for the Financial Independence Podcast so check out this episode to hear more about Chad’s personal story and real-estate investing experience and listen to this episode to discover some of the best real-estate-investing strategies you can use on your journey to financial independence! Finally, make sure you head over to his site to say hello and to check out all the great stuff he’s got going on over there! Paula from AffordAnything.com joined me to discuss how she’s using real estate investing to achieve early financial independence! Very interesting article from Chad. I’ve been thinking about investing in some real estate properties, but haven’t really dived into it as I hear a lot of bad things about being a landlord. Maybe real estate investing isn’t for me right now, but maybe it will be after doing some research and diving in. Keep up the great work, Chad and Brandon! Always exciting to learn more about tax benefit strategies! There are a lot of ways to invest in real estate, some of which require little to no management. For example you could invest in commercial real estate. Right now there a lot of Dollar General Stores looking to sell the store and lease it back under an absolute triple net lease. An absolute triple net lease is one where the tenant is responsible for pays everything, insurance, maintenance, even property taxes. If there is a hole in the roof, tenant takes care of it and pays, if the store closes, they STILL pay the rent, they never call you. Lease terms are often long, 15+ years with rent increases built in and can be guaranteed by the main corporation. Basically you buy the property and get a check every month, no landlording hassles at all and except for the live in flip you get all the benefits of any other real estate investment. There are many great niches in real estate, including net-leased commercial buildings. I personally prefer residential. The management may be a little more intensive, but with the right properties (like well-located single family houses), it can be almost as passive. And residential tends to avoid the large risk of future long-term vacancies and functional obsolescence that come with commercial properties. Who will rent the dollar general when they move out? Or a McDonalds? Often the building is just torn down. But that’s just my take. There’s no right answer. Smart Provisions, landlording must be learned, true. And it has occasional challenges. But most challenges can be solved with a quick phone call (from anywhere in the world). And if you are going to have a side hustle for income, tenants are MUCH easier to manage than employees, contractors, or any other people associated with a business. It’s their home, and if you provide them a good property at a decent price, it can be very hands-off (particularly with only a few properties). Best of luck! Thank you for the concise summary, Coach! Real estate was booming when you stepped into the fray in ’03, but it sure got ugly a few years later, didn’t it? Of course, buying opportunities then presented themselves. Congrats on your Tigers upsetting ‘Bama for the Championship! That, plus a guest spot here — what a great week! In my Podcast episode airing soon with the MadFientist, I talk about my experiences starting in 2003 and surviving through the great recession in 2008-2010. Wasn’t easy! But I learned a lot. And we were able to make some good buys on the way back up. Yes, been a great week. I’m still on cloud 9 as a former Clemson Tiger player. Bringing the national title back to our little town of 15,000 people is something like the movie Hoosiers! Great article – lots of good information. Thank you for putting it together! Mad/Chad… Extremely informative stuff here, thanks for sharing. I especially like the high tech graphics in the YouTube video! Looking forward to the podcast (recently subscribed on Stitcher). Ha, Ha – yeah, my specialty on YouTube is scratching out explanations on notebook paper. Low-tech, but hopefully gets the job done:) Thanks for reading and commenting, RBD! I love it! Afternoon coffee break talking about real estate tax strategies:) Only we financial-nerds (that’s a compliment) can enjoy that kind of thing. Thanks for reading! Nice comprehensive overview! I’ve heard about IRA real estate investing, but never quite figured out how it could work. You sorta have to figure out how to get a good chunk of change in the account first to start the process. Typically, yes it would help to have $50,000 – $100,000 or more to open yourself up to more real estate lending or investing possibilities from your IRA. That could change with the new online lending platforms that allow crowdfunding (not my expertise, but something to check into). You could also partner with other IRAs of financial friends to make one loan. So five accounts with $10,000 could combine to loan $50,000. I did that several times in the beginning when I only had $5-10,000 in mine and my wife’s accounts. You’ll want to get some help drafting documents from a local attorney who understands self-directed IRAs (hard to find). I am surprised I don’t see more information on the “Real Estate Professional” status that you can claim on taxes? I’ve been meaning to learn more about it, but haven’t had a chance. Any chance you can chime in, Coach? Ah its up there, I just missed it! Sri, thank you for bringing up the real estate professional topic. I only mentioned the professional status in passing because I have found the rules to qualify are a tough hurdle for most part-time, early-retirement-focused investors to overcome. You have to spend more time in real estate than your other job/business AND spend more than 750 hours per year with real estate activities. That’s tough for limited benefits for small investors. And there are some advanced strategies like using cost-segregation where you could actually benefit more by NOT being a professional (see this article for an example: https://www.biggerpockets.com/renewsblog/2015/12/18/cost-segregation-case-study/). But, having said all of that I have seen some high-earning couples use the professional status with HUGE benefits. For example, let’s say a doctor who earns $500,000 per year has a spouse who does qualify for the professional status. Any net passive losses could potentially offset ordinary income from earnings – thus saving a bunch on taxes. If that situation fits you, the professional status might be something to look into more, at least for a period of time. I think this is one of the best articles I’ve ever read on the tax benefits of buy and hold rental properties. Awesome job!!! Thanks for this excellent summary. I am FI and soon to be RE through real estate investments, and did not know about the real estate professional tax advantage. I’d be interested in an analysis of real estate investing from the Mad Fientist. Because rental profit is so much more stable than stock market returns, you can get away with the equivalent of much higher withdrawal rates. For example, I’ve invested about $240K (cash) in four houses, and after subtracting taxes, insurance, deferred maintenance, and vacancy, I get about $24K/yr, or 10%, return. I put a good amount of sweat equity into them at first, and I manage them myself, but still, I wouldn’t be even halfway to retirement if I had put the money in the stock market and the sweat equity into a part-time job. I get that it’s not for everybody, but I’m surprised that there isn’t more interest in it in the FIRE community. Jennifer, very well said. I totally agree. Real estate is definitely under-appreciated as an early retirement tool. The withdrawal rate is really a non-factor if you do as you said and earn a solid cash-on-cash return. You could even pay a property manager and still probably earn 6%-8%, which would still put your withdrawal rate (without touching principal) well above heavy stock-portfolio scenarios. There are certainly other disadvantages compared with equities, but I’m obviously biased in favor of a healthy dose of real estate early on in the track towards FIRE. Later you can diversify into other asset classes. Isn’t what President elect Trump did “year of sale”? This is such a fantastic article, cant wait to share with my husband! What do you mean by “year of sale?” Were you referring to something in the article? Great write up. I’m always amazed there isn’t more discussion on RE Investing in the early retirement community. A key point is that properly used depreciation should allow real estate to always run at a tax loss. If there isn’t enough depreciation by breaking out the improvements to the 27.5 yr schedule, you can have a cost segregation study performed which will further break down the improvements with shorter asset class life and accelerate the depreciation you’re able to take in the first several years over ownership. I agree, Ben. RE Investing is a great early retirement tool. Thanks for bringing up cost segregation. My article was already REALLY long, so I didn’t want it to drag on more with that topic. But I posted a link to an article in an earlier comment with an interesting cost-segregation strategy for high-earners. It’s real estate depreciation on steroids! Good deal Chad. By using Real Estate Professional status, I’ve been able to offset quite a bit of W2 earnings, so I think it’s a good strategy for people to be aware of. It’s possible I could’ve done it in earlier years if I would’ve been aware of how to use Cost Seg studies. Great Article! Every year I have wondered what a real estate professional was when Turbo Tax asks me the question and I assumed it was a licensed agent/broker. I have purchased a few houses here in Seattle and converted the basements into rental ADUs(Accessory Dwelling Units/Mother-In-Law apartments). Can I claim that I am a real estate professional if I am the one performing the remodel myself in the evenings and weekends even though I work a full time job? Thanks Tyler! Congrats on your ADU deals. I love those type of creative rentals. Regarding real estate professional status, read this article. It is from a real estate CPA who explains the rules very well: https://www.biggerpockets.com/renewsblog/2014/09/25/your-complete-guide-to-the-real-estate-professional-tax-loophole/. My guess is that it’ll be tough to be a professional while doing this on the side. Either a spouse would need to do it full time, or you could do it once you quit a job. But see my comments about RE professional in response to another commenter. Great article, but one fair warning to Chad, the Mad Fientist and readers – comprehensive tax reform is high on the incoming administration’s agenda and 1031 exchanges are considered a done deal as both sides of the isle see like-kind exchanges as a loophole in the tax code. If you’re going to try for a 1031 exchange, the clock may be ticking. I’ve personally never used a 1031 exchange. With capital gains rates so low during my career and with strategically selling when my tax bracket is lower, it hasn’t been worth the effort and cost for me. What is your opinion on investing in tax-sheltered retirement accounts in compared to investing in real estate? For the last year I have thought about cutting back my 401K contributions and start saving for a house. I’ve always maxed out my 401K and IRA but have always thought about cutting back on my pre-tax contributions to start saving fora down payment. What is your opinion? Do you have a preference towards one or the other? Logan, that’s a great question. I think the spreadsheet experts in the Mad Fientist community should get to work comparing some scenarios (money in real estate vs max-out 401k) because the results would be interesting. Personally, I managed to do both, but I often accomplished it with tight cash by using high leverage early on to buy the real estate and later deleveraging when I had more cash. If your risk tolerance is similar to mine, perhaps you could do the same. But if you have to choose, it’s a tough call. 401k gives you current deductions against ordinary income. But real estate gives you tax sheltered income and growth that you can USE much earlier than a 401k. Anybody else smarter than me have an opinion on this one? I have done the analysis on comparing different type of mortgages and calculated the IRR, NPV, Cash-on-Cash, and the list goes on. The only thing that I can’t figure out how to put into my model is the tax advantages of the real estate. The costs are easy to estimate but the time-invested is not so much. I found that there are certain ratios that make an FHA look better than a Conventional and so-on. For your first property how much did you end up putting down? I have enough for 5% down for my area but other recommend putting at least 20% down. I have a relatively high risk tolerance as I have a ton of time to recover, I’m only 25. In your opinion, what is a better starter home? Single Family or Multi? The multi-family homes in my area are extremely run-down and in my opinion not worth living in even for at a positive cash flow. I might have been looking at too cheap of multi’s in my area and might need to revisit the listing for more expensive MFH’s. So, I decided to change gears and look at single family homes and had though to rent out additional rooms for income. Members of BiggerPockets have mentioned that having boarders or tenants in your primary residence can have it’s complications. When I first started I read some good advice from John Schaub, a real estate author I recommended to someone below. He basically said don’t overanalyze too much on your first deals. It’s very likely you’ll get better and better with each deal if you study your successes and mistakes. Trying to be perfect will probably ensure you won’t buy anything. Of course you never want to buy with bad economics, but if your deal meets some reasonable goals (cash-on-cash return, debt-coverage, cap rate) and the location is good, it’s important just to get started. It’s a lot like dollar-cost averaging with index fund investing. The best real estate investors buy consistently. If you wait 2 years, you’ll miss opportunities for profits and real-world learning. With either 5% down, 20% down, or even 100% down, the important questions are the basic economics I mentioned above. If the deal makes sense with positive cash flow and safe debt (long-term, fixed interest, no balloons), it can make sense even with 0% down. But if the economics are bad, even 100% down can be a bad deal. My first deals were a little unusual because I didn’t put any of my money into them. I used credit partners (http://www.coachcarson.com/credit-partnership-how-to-do-deals-with-a-partners-credit-cash/) who put up the cash. I also used a strategy called BRRR (https://www.biggerpockets.com/renewsblog/2015/04/20/how-to-100000-dollars-year-real-estate/) where I put cash up front and refinanced to pull the cash back out once I fixed the property up and increased the value. But we’ve also done deals lately with 100% of our own money. I like the multiunit house hacks for a first deal if possible. It’s just easier to make the numbers work typically. I would keep studying the market to see if there are multi-units at higher price points. I’d also look to see if you could turn some of these run-down properties around and get the benefit of higher rents. I had an investor I consulted with in South Carolina who is buying many multiunits on one street that was the worst one in an up-and-coming neighborhood. It’s now getting a lot better and he benefits. I wish when younger I had gotten into real estate. Wowza. I can’t imagine making hundreds of deals. I read a few recommended books from the MMM real estate forum and this along with those books show how real estate is a practical way to FI. I’ve only done 6 real estate deals in my life. It’s through those deals, however small they were, that set me up financially the rest of my life. Thank you Chad for taking the time to share your knowledge. And thanks to MadFientist for giving him the platform. Mike, do you care to go into detail? I’m 25 and am itching to get into real estate. My risk tolerance is high yet I can’t seem to take the plunge yet. Thanks for sharing your story, Mike. I think it’s such an important message that 6 deals (or even fewer) are all you need to use real estate to help you retire early with very strong monthly income. It’s great to get confirmation from your experience. Thanks, Chad, for such an informative post, and thanks Mad FIentist for following through on your email promise of a cool upcoming guest post! I have read a lot of books and websites on RE investing over the years (out of interest only – I’m not a practitioner) and this article did a really good job of putting a LOT of information in one place and explaining it well. I’m surprised you haven’t used 1031 exchanges, Chad. 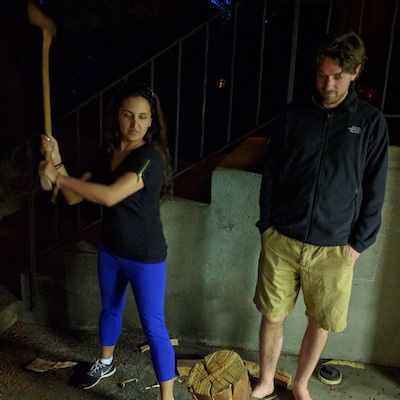 It seemed like a more common tool. I have read about those exchanges being combined with leaving RE to heirs (I.e. Using 1031s to consolidate a portfolio of properties into one or two properties – like a family vacation house – and then passing that on with a stepped-up basis to heirs who aren’t interested in RE investing). Thank you for reading and commenting. I definitely agree that combining 1031 exchanges with holding properties until death is a great formula for paying little or no taxes. I was just able to use other strategies to accomplish the same end result. 1031 exchanges do have downsides, like having to identify properties within a small window of time. Many people buy bad deals in the name of “tax benefits” because they are pressured by this deadline. That sort of defeats the purpose. Regardless, it’s nice to have the who toolbox of available tax benefits to choose from in each particular situation. I’m a big fan of the tax savings. Ever since I set a goal of 1 property per year, my taxes have dropped and now I have enough depreciation to offset W-2. Great post that offers a nice overview of all the tax advantages. One thing that ties in with the early retirement/FIRE is the ability to use the tax savings plus cash flow to retire sooner versus trying to build a massive nest egg in a 401k or IRA. Passive income is amazing compared to active (W-2) income or 401k or IRA distributions. Totally agree about passive income being amazing, Mr. Ten. That’s one of the big strengths of real estate investing. Awesome article, thank you for the great info and breakdown. I’m a member of the US military and dug into tip #5 a bit more. As it turns out, I’m eligible to suspend the 5 year test for up to 10 years due to receiving orders to move from my last duty station where my former home (now rental property) resides. I understand the tax sheltering benefits from capital gains by using this strategy; however, I’m curious if I can combine this with claiming depreciation from my rental property as well. If I claim depreciation over several years, and combine the tax sheltering from tip #5 from the sale of the home, would I benefit from tax sheltering on capital gains and the reclaimed depreciation? I understand that tip #5 shelters from the gains I make from the sale of the home. I’m curious if the depreciation I claim over several years can lower the cost basis, thus increasing the total gains when calculated from a sale. Hope that makes sense. I can clarify further if needed. Thanks for bringing up this extra benefit for active military members. That’s an awesome angle for you and others to get extra time! Capital gains and depreciation are separate considerations. I believe the part of your basis that gets reduced from rental depreciation will be taxed differently than capital gains. It will be recaptured just like any rental that gets sold. I’ve not had this experience with the military exemption personally, so you’d want to check with a tax professional to help you prepare it. Calculating recapture tax on real estate can get VERY complicated. But you’ll still benefit from no tax on the difference between your original basis and your new sales price (i.e. your capital gain). I have an interest in investing in residential real estate for cash flow. Your article went over my head so I obviously need some primers to review before I come back and indulge in this again. Do you have any books or references that you recommend for a beginner? Yeah, the tax benefits can be a little dense when you first start.I recommend the book Building Wealth One House at a Time by John Schaub as a first book to read. He presents concepts very clearly and simply. I wrote a post explaining the basic cash flow formulas you want to know: http://www.coachcarson.com/rental-property-cash-flow/. I also wrote a good beginner post about choosing your real estate strategy at 1500days.com: http://www.1500days.com/best-real-estate-deals-early-retirement/. Hope that helps! Wow. Very comprehensive and interesting post. Thanks for sharing this. So many considerations with real estate investing that I’ve never thought of. There are a lot of great tax benefits from real estate. Nice write-up Chad! I’ve been playing around with the idea of buying rental properties for years, but I make too much to take advantage of the depreciation benefit and with prices so high in my area, I haven’t been able to make it work. If the housing market crashes again, I may have to go look for some deals! I think I know what you mean that you earn too much – you can’t use the full $25,000 passive income loss. But you CAN still offset rental income with depreciation. If people could shelter dividend income from depreciation of their stock companies assets, there would be joy in the streets! Just something to plug into your decision matrix as you look at it again. Definitely keep looking at deals. I’ve found them in up and down markets. What are your thoughts on crowd sharing real estate sites (e.g., realtyshares) versus buying the property yourself? Have you used this or have any pros or cons regarding this? I’ve not tried any crowd sharing sites yet. I have enough success buying direct, and it’s just my preference. I can see a benefit to crowd funding platforms, but I have not done enough due diligence yet to be comfortable. I think the key will be doing the research necessary to get into good deals – just like you would buying direct. The ease of investing your money with a click of a button could make it easy to make lazy/bad decisions. So, that’s my only caution. But worth looking into for those who don’t have time to hunt around for deals. Thank you for this post. I am in the process of looking for a live-in house right now, this has been super informative and pointed me in the right direction. Awesome! Great to hear, Leo. Good luck! A long time ago I read of a strategy. I can’t remember the source otherwise I’d put it here. Here it goes. Person A buys a home and rents to Person B. Person B buys a home and rents to Person A. This reduces the after-tax cost of home ownership substantially due to depreciation. Home repairs and utilities are now a tax deductible cost of doing business. What are the catches with this approach? I know there are limitations in practice (two people need to trust each other, preferably live near each other, not move, etc), but in theory it’s the most beautiful thing I’ve ever seen. Hmmmm … that’s a first for me. Well done! I have to admit I don’t know if there are any catches. I think a CPA who does a lot of real estate returns and who is more familiar with tax code and tax court cases could tell us better. I’ll plug that into my brain to run by someone more qualified in the future:). These are all great strategies that need to be discussed more often as they are confusing. With experience and time being a land lord I hope to learn all of these. I just bought my first duplex and will take advantage of these this year. Thanks for the post. I agree that it helps to review these concepts a lot in order to get them. I’ve found tax strategies to not always be intuitive (go figure! ), so it takes some logical, slow thinking to sink in. Congrats on your first duplex! I hope it’s a fun, financially successful journey for you! Thanks for the great post Chad! My husband and I are looking to purchase our first investment property and I’m hoping we will start making offers soon. I appreciated your comments above about not getting stuck in analysis paralysis, but even with the numbers worked out I still worry that there are factors we haven’t considered. So although I know we will likely make some mistakes along the way, I’m excited to use real estate investment to help us reach FI faster! Question for you – I know we need to talk with a CPA sooner than later. However, we will be investing in a different state than where we currently live (but where my husband still co-owns a business), do you have any suggestions for finding a CPA that specializes in real estate? I assume we want someone familiar with the state we will be investing in. Thanks for the great and concise info! Thanks for the comment! And it’s exciting that you’re looking for your first purchase. I remember well the fear and the rush of it! I can guarantee you will be factors you’ll miss. The best I can tell you is don’t miss on the big stuff – like your monthly cash flow analysis and big, unexpected capital repairs (roof, HVAC, sewer issues, structural issues, etc). The first you can get some help on with an article I wrote (http://www.coachcarson.com/rental-property-cash-flow/). The second can be covered with a professional inspector + qualified contractor. On the CPA question – I know plenty of CPAs who work in multiple states. They don’t need to be local. Numbers are numbers, and the IRS code applies to all states. Contact me at chad (at) coachcarson.com and I’ll let you know who I use. Excellent! I have owned rental property for 18 years, staring when I was 27. I cringe at the awesome deals I passed by because I lacked the experience to see their potential. That said, it has been a great knowledge building tool for me. Thanks to the tenants, my five houses are now paid for and while they don’t provide a living they do provide a great tax advantage. Great post! Wow, Jenn. I love your story! I’d say 5 paid-for houses is a pretty impressive accomplishment. And the income from those houses alone is far better than the pensions or 401k incomes most people will get. Thanks for sharing! A wonderfully put together resource once again. I’m still several years off from starting my real estate game, but always nice to develop the background knowledge now so I’m better able to take advantage of opportunities later. Especially like the point of acknowledging that taxes can both make or break an investment if you aren’t careful. Thank you Sam. Glad this can be a resource as your prepare for your own entry into real estate. 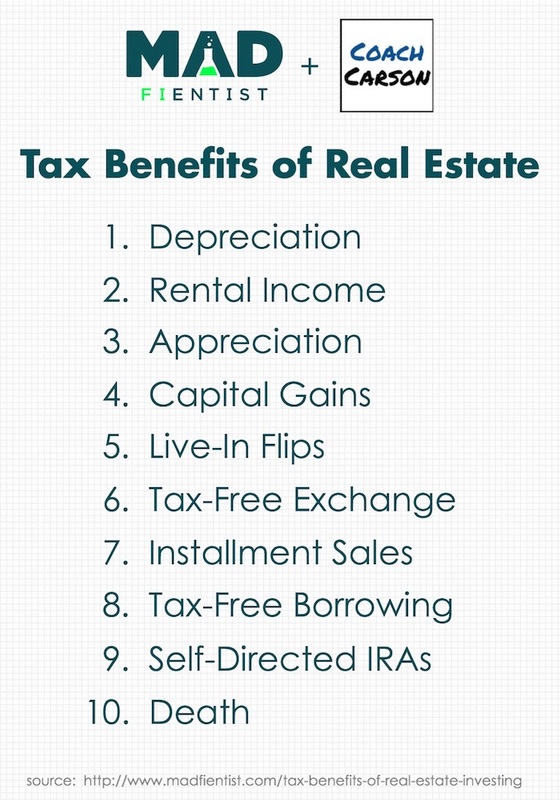 Great overview of some of the tax benefits available to real estate investors. myself, I’ve been invested in a real estate property for about 10 years and while there are certainly many advantages, there can also be some significant headaches as well. Anyone considering the path of real estate should realize that while it does have great benefits, it is also a semi-passive investment, meaning you will need to be involved at some point, usually when you don’t want to be (like in the middle of January dealing with broken water pipes!) Anyway – I digress, thanks for sharing all this! No doubt real estate is not completely passive. I have also had some rough situations like yours with flooding water, etc. Luckily those don’t happen too often, and even as a self-manager I don’t ever physically do any of that work. So, it’s still a cell phone call from anywhere in the world to take care of problems. It’s worth the tremendous upside to me. And I would also point out that all investments have their headaches. Even passive ones. I’ve never had the stress/headache of my entire portfolio being passively in equities and watching the bottom fall out of my net worth during a down turn. Yes, real estate values have gone down, but incomes (the biggest benefit in my book) have remained steady or increased. I’ll take the rare maintenance call headache over market crashes I can’t control. Great article. Perhaps I missed it, but I did not see a mention of the interest shield as well as a tax benefit. By interest shield do you mean that interest expenses are deductible? If so, I did mention briefly in the section on I.D.E.A.L. investment. But it wasn’t one of my primary tax benefits, and I agree that it is a big deal that you can borrow to buy a property and also deduct the interest on that borrowing. So, thank you for bringing it up again. I bought my first property when I was 22 and was afraid to buy more as a cash flow. It helped me pay the mortgage and also gave me a lot of the tax benefits that are mentioned here. I wish I had done more when I was younger but I was too afraid of other “hidden costs”, but today it generates a nice income stream that I can count on each month. Great to hear your story, D4F. I hear a lot of people say they wish they had done more earlier on. It’s a tough balance between risk, hassle, and reward. The “live in 2 years and flip” method mentions homes, will this apply to a live in 2 or 3 flat building? Patrick – Yes, as long as it’s your principle residence it’ll work. I’m just getting started myself with 2 properties. I’m a Buffet hold believer for sure! I think my biggest takeaway was to get a CPA. It’s something I’ve been on the fence about for a while but I think it’s time to get one. Thanks Financialbloke! Yeah, when you start getting into the nitty gritty I find a good CPA is more than worth it. Even if you know your stuff, it’s like an insurance policy to have someone else look it over for you and to have someone on deck to help defend you in case of an audit. Glad you’re a Buffett buy-and-hold investor too. So many great lessons from his example. Thanks for taking the time to write these down. very well written and detailed advice. I have been on the fence about really getting into real estate investing primarily due to the cost/return being out of whack in the DC area (monthly rents were ~.5% of purchase price) and not sure i was going to be living there forever. Well, we moved this past year to WI to be near family and the financials here look like they are making a lot more sense (monthly rents close to or slightly over 1% of purchase price). New job is taking a lot of my time at the moment, but as soon as things settle down i think i am going to start looking for possibilities. Currently i am working through the tax issues with having sold my home in DC and finding it a lot more difficult to get a clear answer than i thought. This is sort of a long shot but figured i would see if you knew of any clarification on one tax rule that is tripping me up for lack of clear explanation, or had dealt with this one before. .
That indicate that Any other period of temporary absence (not to exceed an aggregate period of 2 years) due to change of employment, health conditions, or such other unforeseen circumstances as may be specified by the IRS. does not count as non qualified use. I have found specific examples covering other exemptions, but not the specific one i am dealing with. Have you dealt with this situation or anything similar? Thanks! Good luck with the Wisconsin properties. Yeah, those numbers sound a lot more reasonable. I have a friend who invests in D.C., but he buys multiunits and does work to increase rents to make the numbers work. Regarding your situation, I’m familiar with the code to an extent, but I think the nuances of your situation would benefit from a CPA consult rather than my guesses. And preferebly the CPA needs to be someone familiar with real estate parts of the IRS code, because it’s big and there are a lot of specialties within it. Hope you can get it straightened out. Was it a big gain where it’ll really make a difference? If you had a tiny gain it might not be worth the trouble. I like the idea of living in the flipped property. I wonder if I could get away with owning and maintaining it for two years instead of actually living in it. I don’t think that my family would like moving every few years. Maybe you could even rent it out for a few years before you flip it. You can get away with it until you get audited. Lol. I wouldn’t play with that fire. It’s a great tool, but not worth trying to sneak it by. Rentals without the live-in flip rules are still a great deal using 1031 exchanges or just timing sales to lower tax bracket times when you can get low or $.0 capital gains tax. Good luck! There’s an additional benefit here. Encumbering properties can be a wealth preservation technique when properties are owned by a properly created and managed LLC or trust (properly created and managed as in the veil cannot readily be pierced). I’m not sure encumbering for wealth preservation alone makes sense, but it is an advantage worth noting when deciding whether to refinance. Yes, good point. Wealth preservation/asset protection is an entirely different subject, but definitely worth noting. There are all sorts of risks to mitigate. Sometimes the same technique will help mitigate multiple risks, but sometimes they work against each other. Thanks for bringing it up. Love the article, very well thought out and great suggestions. Although pretty sure I’m good without the last one I’d like to stem that off as long as possible :), but that being said it truly is a valid argument that most people probably don’t think of. In honor of the all-wise Spock from Star-Trek, I hope everyone reading this article “lives long and prospers.” But that final tax benefit certainly WILL come into play some day for all of us. :) Thanks for commenting. The live in flip thing changed like 6 years ago. Now it’s prorated based on the time you lived in it versus the time it was a rental. So no real benefit versus any other primary residence, and no “move in two years and it’s all free” loophole. I was disappointed to see someone as knowledgeable as Chad still spreading that old misinformation. Lots of people researching on the Internet find old articles with it, and think it’s still the case. There’s even new articles published with it (like this one) that I see on places like BiggerPockets. I’d hope new ones published would have the correct information for people, but sadly not. The rest of the article was fantastic! Well done, overall! Looking forward to listening to the podcast. 3. Sell it and pay no tax on the gain (up to $250,000 individual/ $500,000 couple filing jointly). 4. Repeat this as soon as every 2 years. 3. Sell it … and now can not exempt all their gain from tax. They must apply a prorated formula to determine the amount of tax. The entire applicable tax code for the capital gains tax exclusion for a principal residence is at IRC Section 121. Everyone can read it for yourselves here: https://www.law.cornell.edu/uscode/text/26/121. In 2008 Congress amended part of the code with the Housing Assitance Tax Act of 2008. The amended part of this section I believe begins after 121(b)(4). This is the part that affects people who move into their INVESTMENT properties. I agree with everything you’ve posted there. The key part being that you must purchase and live in it first as a primary residence. I think your post should be amended to emphasize that, because as written, it is not clear. …you can’t just move into an investment house, and live in it 2 of the last 5 years. This used to be true, but it is no longer. Rather, you need to live in it first, and that’s key. Thanks for the suggestion. I can see how that could be misunderstood. That section has been updated. Cheers! Great write up and I think some people are meant to build real estate empires but I don’t want to be a landlord for a few reasons (like I mention in my book). It’s too active of an investment for me personally and becomes a business vs. a passive investment without a property manager eating away at returns, I don’t want all of my eggs in one basket and real estate takes time to liquidate. These are great tax considerations and I appreciate the time you took to learn and share them but real estate returns seem to come close to my passive diversified index fund portfolio after all taxes, expenses and inflation. Leverage (risk) is key to get to the point where you can get multi-unit properties to get the most bang for the buck but that requires a large commitment in funds focused on just real estate. Instead I get my real estate exposure by using a REIT in my IRA (because of tax-inefficiencies) and have been happy thus far. Thanks for sharing. That’s why early retirement/financial independence is such a fun subject. There is not just one path that makes sense. And everyone can customize their path based upon their preferences, skills, and goals. Chad, good and informative article. I am personally not a fan of real estate investing but I think if I lived in a different area of the country where prices were lower, I might have gotten into it. And actually, I did invest in one vacation/rental property in a mountain town and what a mistake! I owned it for 11 years and while we had fun using it during the winter it was too far away to be able to effectively stay on top of all the maintenance and if I had done the math, I would have realized that I could have earned more money elsewhere. I do appreciate how thorough and informative this article is… I wish I would have read something like this before I dove off the high dive to buy a rental property thinking that even if I lost money, I would realize some tax savings but I was not aware of the income threshold on this. At any rate, this is a great synopsis of all the tax benefits of real estate and would really help anybody who is interested in doing a really good cash flow and ROI analysis based on their own specific situations. Hello! Are there ways to avoid taxes if you live in your house AND rent it out at the same time? I can’t find anything on this.. help!! Chad, thank you so much for posting this amazing information! My wife and I recently purchased a property on the cheap with a mobile home on it that needs renovation. My goal is to fix it up and then rent it out for this passive income you speak of. My lack of experience with this caused me to search until i stumbled on this article. This article and its core ideas come across to me as investment strategies for retirement, and although what i’m about to say is semantics, I am interested in doing this to replace one or both of our incomes. Not necessarily to retire, but overall life simplification and allow at least my wife to quit work. What I would like your thoughts on is this: Once I have this first property rented out and bringing in some money, I am interested in buying more properties to rent out to eventually replace one or both income(s). Is this a realistic approach? I feel it is, but reading your thoughts will help me overcome my doubts about the unknowns! Hey Mike! Thanks for reading the article. Retirement is one of those funny words that has a lot of loaded meanings. But to me, real estate is perfect for exactly what you’re talking about – replacing your job income. That’s exactly what it’s done for me. There are challenges to living off rental income, like anything else, but once you get a property stabilized with long-term tenants, it can be very consistent. And if you’re willing to manage it yourself, that will add some extra to your bottom line. Good luck with your next steps. Feel free to follow me at coachcarson.com to leave comments and get more detailed information on using rentals to retire. Thanks! Great Article! I think this is the best post I have ever seen about the amazing tax benefits of real estate investing. It will surely help many new investors. Well done! Thank you for the compliment, Marek! Great article, lots of information! If a partner in a partnership where that partnership is itself a partner in the investment of unimproved, vacant land (we may or may not develop on it), are the real estate taxes that are paid on the land added to the basis of the partnership’s investment or are they immediately deductible on the partner’s 1040 Schedule A? Either way, does an election have to be made? Thank you and I look forward to more of your articles. Great writeup Chad! I’m considering investing in real estate in the form of an RV site at a luxury motorcoach resort. 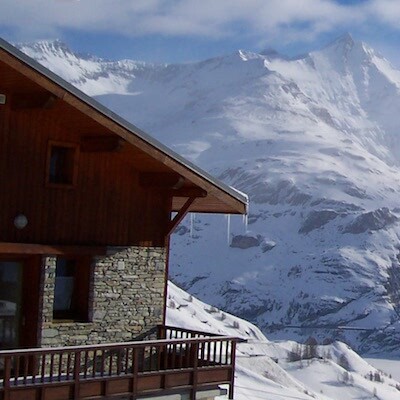 These types of resorts often have options to rent your site when you are not using it. Are there any things to be wary of or consider before making this investment? Thanks Troy! I have not done any RV site rentals myself, but from talking to others who have, you want to make sure the management of the entire park is solid. They are the ones who screen other sites owners, enforce rules, etc. It’s a lot like the homeowners association (HOA) of a condo or housing development. If they’re not on top of things, a luxury park could turn bad quickly (and you’d have little control over it). That being said, I love the low cost of entry and flexibility, so sounds like a cool idea to explore! Good luck. Great information!! We have 2 properties in self-directed IRA’s. The dilemma is that one of them has parents as 50% owner. While we would like to buy them out, it is a prohibited transaction. The property is also in their living trust whereby we may or may not inherit it. However, from what I am reading we cannot inherit the actual house and it has to be sold for us to get the “cash” inheritance. Have you come across any solution to this except to wait it out and get the cash, which means we don’t have the stepped up value benefit, but then don’t have inheritance tax on the cash either. I am wondering if their estate has to pay the capital gains in the end as well. Timing is everything and the market is up right now, we will be at the mercy of the market if we wait. May be better to sell it right now. Diane, the IRA + family deals get very tricky, very fast. I think this is a situation for a tax attorney or very qualified CPA who knows a lot about self-directed IRAs. I’d consult with them before making any sale decisions. But I can see how it would be helpful to make the right decision in your situation. Good luck. I invested in a rental property 20 years ago. Of course the location was not good. Until the last 6 years I’ve been getting more positive cash flow due to the appreciation and rent increases. I hear that if my heirs get the property when I’m no longer around, will they get a stepped up basis. By the way, I purchased the property via a 1031 exchange. What I just found out is that I never told (my ignorance) the IRS that the purchase was for INVESTMENT only. Would my heirs qualify for a stepped up basis after I’m gone and can I still tell the IRS that this property should be classified as INVESTMENT category? Raymond, I’m not sure I’m 100% clear on your situation and the investment classification. There are 1031 intermediaries and perhaps knowledgeable CPAs who could dig into the details a little more and help you straighten it out. That’s where I would start in your shoes. Chad, are you able to recommend knowledgeable RE CPA’s in certain areas of the country? I invest solely in passive CRE equity and debt sponsors (mostly directly, not so much via crowdfunding). Am a newbie, but clearly see the value of diversifying assets more now near retirement in addition to the tax benefits and performance of CRE. I live in northern Westchester County, NY. Would be happy to include retirement planning generally, but I have a fair knowledge of this, so this is secondary. Amanda Han (http://www.keystonecpa.com/custom1.php) on west coast and Brandon Hall (https://www.therealestatecpa.com/) on the east coast seem to be solid CPAs who write a lot about real estate on BiggerPockets. I have not used them, but I like their content. I use Brandon Smith in Greenville, SC (http://www.smithandshin.net/), and he’s a real estate-focused CPA and does work with people out of state I think. Question Raymond, what do you mean you never told IRS it was investment property. I assume you reported the income from the property so by just reporting that on your return, I believe it would be investment (vs. personal). I’m trying to figure out if this tax strategy is feasible… Say that I have a profitable C-Corp and elect to keep a certain percentage as retained earnings. It’s my understanding that retained earnings can be used to purchase property that has a business purpose. In my case, a property that has a residential property and land (that could be used for building a warehouse, etc). My angle here is that if I can buy property with retained earnings – it’s basically like buying property pre-tax. Am I off track? Terry, I think your principle of using retained earnings (which are tax efficient – especially with new, low corporate tax rates) to buy property makes sense. It’s a good way to compound. But almost every tax advisor I’ve spoken with recommends not buying property in a c-corporation. I think the tricky part is when you plan to get the profits out of the corporation (i.e. double taxation). And there may be some other gotchyas. Here’s a VERY nerdy look at the reasons why from a tax writer I like: https://www.forbes.com/sites/anthonynitti/2014/01/28/tax-geek-tuesday-why-you-should-never-hold-real-estate-in-a-corporation/#2268b757693e. But the final decision of whether this makes sense or not is a little beyond my expertise, honestly. Cool article about real estate investing. It’s nice to know that active appreciation happens when you can force the value higher. It sounds important to know when exactly you should do this, especially if it affects how much income you get. I’ve been looking into getting into real estate investing lately. This was such a good read! Chad, great article! I’m going to take a look at your book! Quick question: How do re investors navigate ObamaCare and qualifying for subsidies? With a Roth ladder for example a family of 4 can have 30k/year in income that is dependable, and qualify for some serious subsidies. However with RE it is a bit different, how do you qualify for subsidies? Income can be dependent on how many repairs were made, vacancies, and got organizations don’t necessarily treat rental income in the same regard as a Roth ladder? Any comment on this? This is an awesome blog for starting a real estate career. Yes, real estate is a bit complicated and you need to know each every process. If only the same could be said in the United Kingdom. Unfortunately here, the policy direction in the last few governments has been to clamp down on real estate investment because there’s a view that it’s caused prices to rocket. The view is popular and widely-held even though the greater reason is a demand-supply imbalance based on population growth and density. As a consequence, every possible tax break has (or is being) eliminated, and the tax-deductibility of mortgage interest payments is being artificially constrained. An extra tax of 3% of the total value of the property is applied on purchase if the property is not the only property that you will own (i.e. if you own another property anywhere in the world). As a consequence, it’s become a lot less attractive to own and rent property and those of us who were relying on this asset class to secure a nest egg are having to reevaluate our portfolio rapidly, even though these assets aren’t the easiest to liquidate. Nice story! RE has generally been a good investment over time. Not as good as stocks I think. What ‘makes’ RE good is leverage. And the tax code which unfortunately subsidizes RE. Government policy props up RE as an investment. These are what helped cause the 08-09 crisis. Rates have been kept artificially low since then. We learned nothing! It’s interesting how you said that it was beneficial to simply die with your property in your ownership so you can pass it on to someone else. Buying some kind of a ranch for sale or something like that would be really great! That way your property can help you have some fun while also giving you some benefits. Another reason for investing in commercial properties is that they offer higher rental certainty due to the long-term nature of the leases; somewhere around 3 to 10 years. If you are looking for commercial real estate property in Texas, contact Fort Bend County, they have wide range of commercial properties suitable for all types of businesses. I live in CT. The laws and courts are not friendly toward landlords here, and I don’t have the temperament to be a landlord. How can I add Realestate to my portfolio without dealing with residential tenants?